There are many reasons to run an ultra marathon – to challenge yourself physically and mentally, to provide a goal to train towards, to see a beautiful area of the country or just so you can call yourself an ultra marathoner. Unfortunately for me the reason was less romantic and far less well thought through. It seemed like a good idea at the time. So here I was nine months later. Standing in a park in Ambleside, underprepared and overwhelmed alongside 310 others all with their own reason for being there. As if running 55km wasn’t scary enough we were delayed starting because the winner of the 110km event has surpassed all expectations and finished before we had even started. 110km and 4000m of hills in under 11 hours. I definitely don’t belong here, oh god what have I done? Before I had time to back out we were off and straight into the first classic race mistake, starting too quickly. 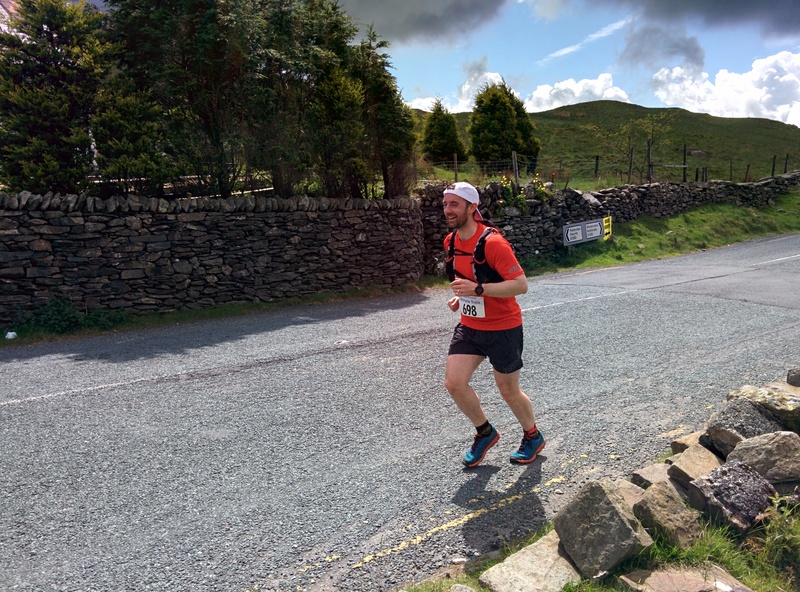 The first 6km took us steadily uphill from Ambleside to the Kirkstone Pass and I settled in just behind Ali being pulled along faster than I had planned. At the top of the pass we hit checkpoint 1 and Ali suggested he was going to “make up time on the downhills”. Next time I looked up he was 100m ahead bounding along the grassy path like a gazelle. 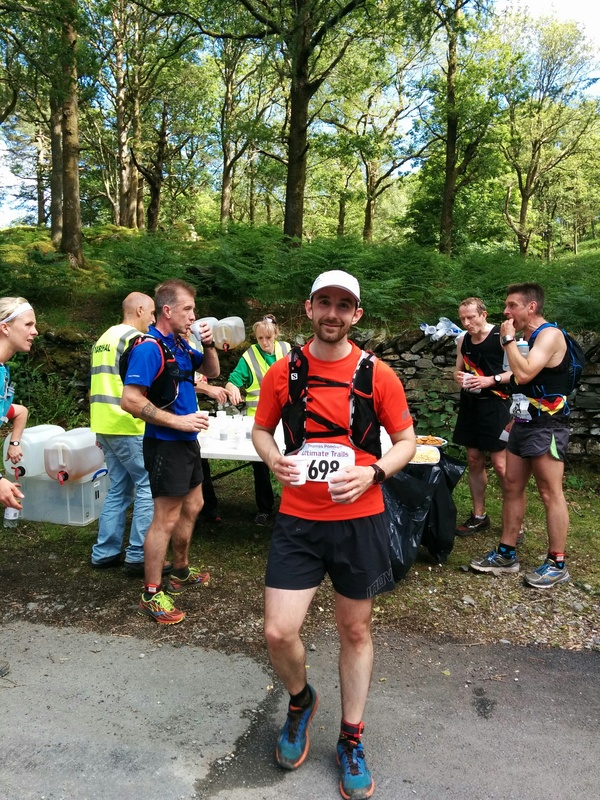 As much as I enjoyed his company it was nice to be able to settle into my own pace and the next 10km to checkpoint 2 in Glenridding was a nice way to get some distance under my belt. Kirsty, Hannah and my parents were waiting at the checkpoint so I took the opportunity to apply some sun cream as the temperature was rising quickly as the cloud burnt off. From CP2 the real hard work began as we started the ascent up Grisedale valley. The path was fairly rocky and undulating so it was difficult to get a consistent rhythm going and the pace started to slow as the gradient increased towards the race highpoint at Grisedale Tarn. The last kilometre or so was really hard work and as I crested the ridge my legs were feeling very heavy. I was looking forward to getting going downhill to Grasmere but the descent was very technical and much harder work than I expected. 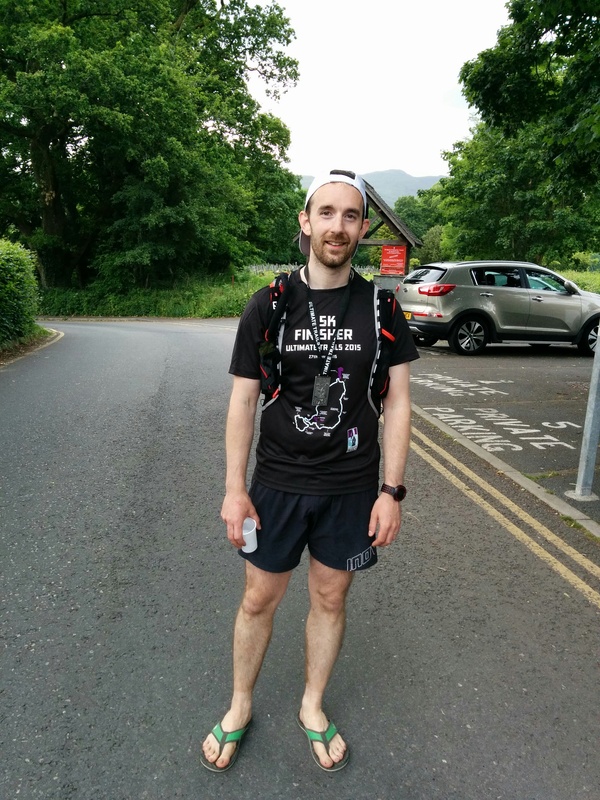 By the time I reached the A591 I was starting to feel quite nauseous but I pushed on to checkpoint 3 in Grasmere at 31km in the hope that the magical combo of noodles, coffee and paracetamol would perk me up. After fuelling up I still felt pretty sick so I walked the next section up to the top of Silver Howe where I got my first glimpse of the beautiful Langdale valley. I’m not sure if it was the views or the chemical stimulation but my second wind kicked in and I started to pick up the pace down to Chapel Stile where I got a moral boosting welcome from Mum and Dad. I continued across the valley to checkpoint 4 at around 37km where Kirsty and Hannah were once again there to welcome me. Feeling good, I decided to move through quickly to maintain my momentum. The section around the back of the Langdale valley was fairly uneventful. I fell into the rhythm of walking uphill and running the flats and downs and soon arrived at Blea Tarn ready to tackle the steep downhill to the Old Dungeon Ghyll where I saw Kirsty and Hannah for the final time. They had come to meet me ahead of CP5 in order to reach the finish in time to see Ali come in. It seems that his pace had remained high since I last saw him 40km ago! Checkpoint 5 was at the Stickle Barn Inn where I took on some final fuel in the form of soup and chips. My parents appeared to say hello one final time and I set off for the final 11km back to Ambleside. My main aim for the day was to complete the race but deep down I knew I really wanted to finish in under 8 hours and it was at this point that I realised it was going to be a close run thing. With this in mind I tried to get into a consistent pace and start checking off the kilometres but the hills just kept coming. With around 3-4 kilometres to go I saw a familiar figure as I passed Garry, a fellow Otley AC member, who was close to completing the 110 km race after starting around 18 hours ago. We exchange a brief hello and I pushed on, eager to get to the end. When I lost time uphill I pushed myself going downhill to try and make up the pace and when I hit the final descent into Ambleside I emptied the tanks to try and get in with time to spare. My Dad jogged the final metres into the park with me and I crossed the finish line in 7 hours 52 minutes and 48 seconds. After finishing I was surprised to find that I wasn’t aching as much as I expected. Unfortunately my digestive system was waking up to the fact that it was all over and started its 12 hour strike during which it rejected anything I tried to tempt it with. 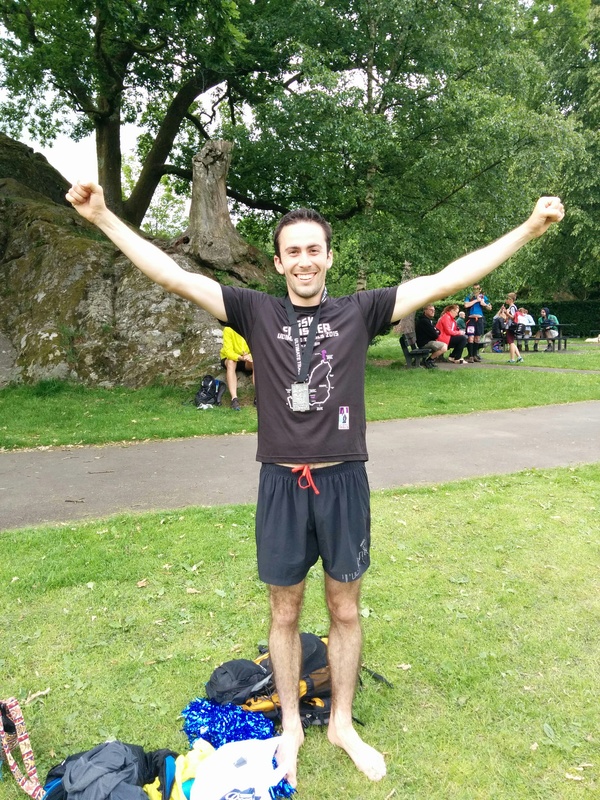 When the results came out Ali had finished in 4th place – an incredible result. I was chuffed to find I had finished 38th out of 311 finishers. 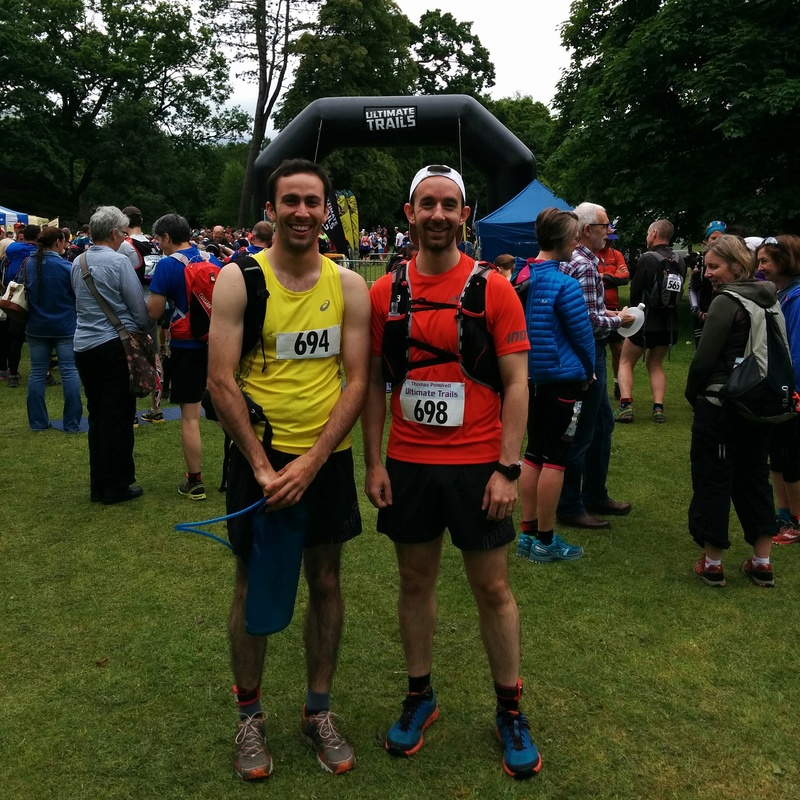 Far better than I had expected for my first ultra and brilliant inspiration to get back out for another race this year. 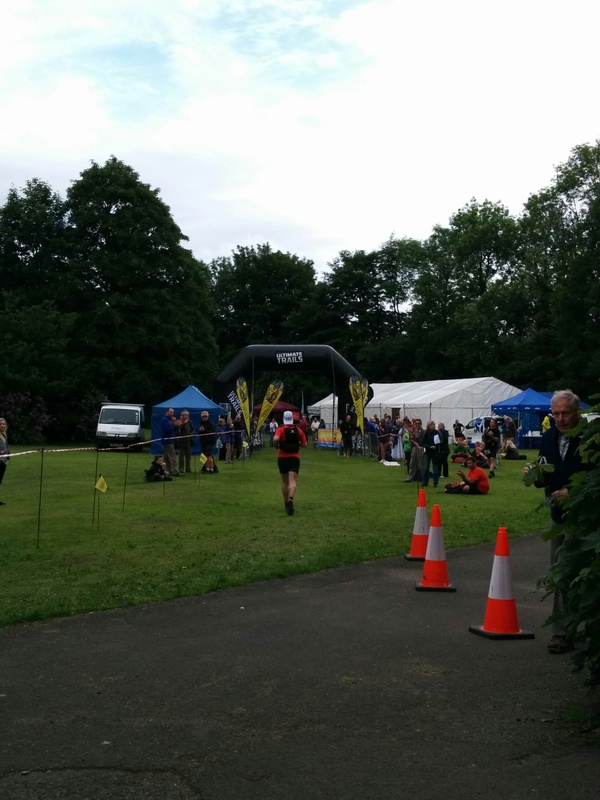 Garry came in 102nd of 194 finishers in the longer race in an impressive 18 hours 56 minutes and 29 seconds. Seeing him near the end of the race made me appreciate just how short my “ultra” was in comparison. Maybe different adjectives are needed for distances and I’m really just a mega-marathoner? Thanks so much to Kirsty, Hannah, Mum and Dad for all the support and helping me keep going when I was feeling empty. I owe my result to you!